Windows 8.1 came pre-installed with Dell Inspiron 15 3531 if you purchase it. And for Windows 7 fans, you might want to install this OS in this laptop. This laptop has the drivers for Win 7 OS, so you can do the downgrade. Before you do this, you should have backup your laptop, if in case you want to install Windows 8.1 OS back. This means, everything in your laptop will be gone or all wiped after Windows 7 installation process, you won’t see any of your previous files on your computer. Since this Inspiron 15 3531 model doesn’t come with a Pro version of Windows 8.1, you will need to buy Windows 7 license key. If it is a retail disc, you will need Win 7 Service Pack 1. You should also know that if you downgrade to Win 7, the software support of your laptop will be no longer supported by Dell, read this tut if you need your Service tag to get Dell’s support. So it’s recommended, your laptop is fully functional before you do the downgrade/installation. 1. If you receive, “Windows cannot be installed on this disk. The selected disk is of the GPT partition style” error message on the screen where you have to select partition, you will need to create a new partition. Dell official article to downgrade to Windows 7. 1. Create a recovery media. Shut down your laptop. Select “Disabled” on “Secure Boot Control” option. 4. Hit the F10 key, this will save all above process and exit. 5. Plugin your installation DVD or a USB drive to boot. 6. Follow the instruction to install Windows 7. This will enable you using Windows 7 on this Dell laptop. Thanks for the info! 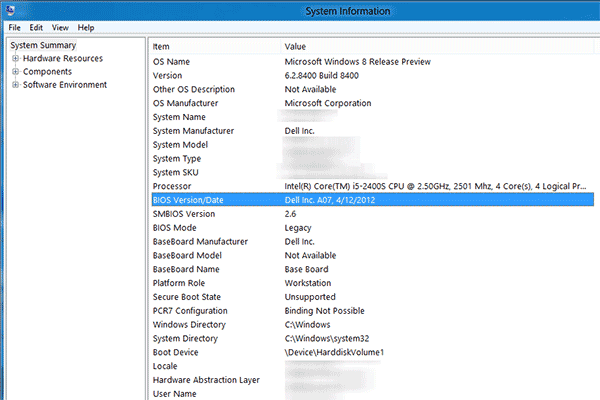 Dell has released a new BIOS update on 21 October 2014. “X19” Version. Will this version work well or is it best to install the oldest “A2” version? Not sure about the new BIOS, when I did it, the newest wasn’t there. Dell support forum might help. Thanks You Are Genius Person… It Did Solved My Problem… I love You,,, Hahaha!